Thompson Genealogy Reunions and Arlington Iowa | Iowaz iowaz@swbell.net | Fotki.com, photo and video sharing made easy. n 1853/54 with his sister Martha Jane Sherman Thompson to farm 4mi SE of Fayette. Bro/law Samuel Thompson set Josh up farming in sec 36 of Smithfield, in the Thompson neighborhood, in the early 1860's. Josh would remarry and sell his Smithfield farm following children to CO and then to MN. His sister Martha Jane would remarry Ben Little and eventually move to Harper.Co.KS with her sons. .. +KIRBY, Eliza b: 31 Mar 1825 in Bedford Co, PA? or Harrison(Carroll) Co, OH d: 02 Jan 1881 in Brush Cr. (Arlington in 1895), Fayette Co, IA. Burial: Brush Creek (Arlington, Groat) Cem, Sec 32, Fairfield.Twp, Fay.Co.IA m: 18 Dec 1845 in Perry Twp, Carroll Co, Ohio Father: Isaac KIRBY Mother: Elizabeth WALTERS Note 3: Married by O.W. Wiggs. Note 5: Died from consumption (TB). Note 6: Age at death; 55y9m3d. 2 THOMPSON, Melissa Malissa b: 25 Sep 1846 in Lamertine (Perryville), Carroll.Co.OH d: 02 Apr 1873 in Arlington, Fairfield.Twp, Fay.Co.IA Burial: Brush Creek (Arlington, Groat) Cem, Sec 32, Fairfield.Twp, Fay.Co.IA Note 21: Age at death; 26y6m8d. ... + WOOD, Lemuel L. b: 26 Jun 1846 in Loudon.Twp, Carroll.Co.OH d: 14 Nov 1916 in Sargent, Custer.Co.NE Burial: Mt. Hope Cem, north of Sargent, Custer Co, NE m: 1866 in Ohio or Brush Creek (Arlington), Fay.Co.IA Father: Henry WOOD Mother: Margaret SLATES Note 4: Bef. 1845 Parents born PA; migrated to Carroll Co, OH. Note 10: 03 Apr 1873 Married Minerva Thompson, sister of 1st wife Mallisa (day after her death). Note 13: 1880 Census: carpenter & joiner, Brush Cr. village (Arlington), Fairfield.Twp, Fay.Co.IA Note 16: Mar 1884 Moved from Brush.Creek.IA to Grand.Island.NE Note 17: 1885 Homesteaded (dairy farm) in Dry Valley, near Sargent, Custer Co, Neb. Note 19: 1900 Census; farming, Douglas Grove Twp, Custer Co, NB. Note 20: Jun 1900 Lemuel53, Minerva51, Wm Henry22, ZellaM19, AlunaL12, Eli Thompson75. Note 22: 1910 Census; contractor, building houses, Sargent, Custer.Co.NE Note 23: 1910 Lemuel63, Manerva62, Will22 carpenter shop, Zella29 teacher in common sch. 3 WOOD, Eli Merton Murtin b: Jun 1867 in Brush Creek (Arlington), Fayette Co, IA d: 1946 in Sargent area, Custer.Co.NE Burial: Mt. Hope Cem, north of Sargent, Custer Co, NE Note 11: 1900 Census; farming, Douglas.Grove.Twp, Custer.Co.NE; Amos, Thompson, Wood area. Note 13: Bet. 1908 - 1910 Sargent.Co.NE to Des Moines, IA. Note 15: 1910 Census; building painter, 13th St, Des Moines, Polk.Co.IA. Note 16: EliM1868, LestaL1875, WilfredR1895, Emma1899, CallyL1902, Margaret1905, NoraE1907. .... +KROHN, Augusta L. b: Oct 1874 in MI d: 1963 in Sargent area, Custer.Co.NE Burial: Mt. Hope Cem, north of Sargent, Custer Co, NE m: 1894 in NE Father: August KROHN Mother: Emma UNKNOWN Note 4: Parents b. Germany. 2 THOMPSON, Minerva Alma b: 05 Jul 1848 in Lamertine (Perryville), Carroll.Co.OH d: 26 Sep 1925 in Sargent, Custer.Co.NE Burial: Mt. Hope Cem, north of Sargent, Custer Co, NE Note 3: Spelling? Manervia. Note 5: 20 Sep 1925 Stroke, never regained consciousness. ... + WOOD, Lemuel L. b: 26 Jun 1846 in Loudon.Twp, Carroll.Co.OH d: 14 Nov 1916 in Sargent, Custer.Co.NE Burial: Mt. Hope Cem, north of Sargent, Custer Co, NE m: 03 Apr 1873 in Brush Creek (Arlington), Fairfield Twp, Fayette Co, IA Father: Henry WOOD Mother: Margaret SLATES Note 4: Bef. 1845 Parents born PA; migrated to Carroll Co, OH. Note 10: 03 Apr 1873 Married Minerva Thompson, sister of 1st wife Mallisa (day after her death). Note 13: 1880 Census: carpenter & joiner, Brush Cr. village (Arlington), Fairfield.Twp, Fay.Co.IA Note 16: Mar 1884 Moved from Brush.Creek.IA to Grand.Island.NE Note 17: 1885 Homesteaded (dairy farm) in Dry Valley, near Sargent, Custer Co, Neb. Note 19: 1900 Census; farming, Douglas Grove Twp, Custer Co, NB. Note 20: Jun 1900 Lemuel53, Minerva51, Wm Henry22, ZellaM19, AlunaL12, Eli Thompson75. Note 22: 1910 Census; contractor, building houses, Sargent, Custer.Co.NE Note 23: 1910 Lemuel63, Manerva62, Will22 carpenter shop, Zella29 teacher in common sch. 3 WOOD, Amos Latimer b: 10 Dec 1876 in Brush Creek (Arlington), Fayette Co, IA. d: 18 Oct 1908 in Neb Burial: Mt. Hope Cem, north of Sargent, Custer Co, NE Note 3: Unmarried. Note 4: Railroad man. Note 5: Died, railroad accident, day before retirment. 3 WOOD, William Henry b: Feb 1878 in Brush Creek (Arlington), Fayette Co, IA. d: 1940 in Custer.Co.NE Burial: Mt. Hope Cem, north of Sargent, Custer Co, NE Note 3: 1910 Carpenter, working/living with father. 3  WOOD, Zella Minerva b: 15 Jan 1881 in Brush Creek (Arlington), Fayette Co, IA. Note 1: Name? Zella? Note 2: Married first cousin. Note 3: 1910 At home; teaching school, Sargent, NB. Note 5: 1925 Living, Waterloo, IA. .... + SCOTT, Wilfred Dwight b: 19 Dec 1881 in West Union area, Union.Twp, Fay.Co.IA d: 1960 m: Jun 1912 in Sargent, Custer Co, Neb. Father: Henry SCOTT Mother: Ellen Priscilla THOMPSON Note 3: Married first cousin. Note 4: Construction & electical work. Note 5: 1925 Living, Waterloo, IA. Note 7: 1954 Living 922 Bodwitch Ave, Aurora, ILL.
3 WOOD, Samuel b: 31 Oct 1883 in Brush Creek (Arlington), Fayette Co, Iowa Note 3: Birth listed at Fayette Co Hist building? Note 4: Birth not listed anywhere else? 2  THOMPSON, John Richard b: 06 Aug 1850 in Perryville, Perry.Twp, Carroll.Co.OH d: 27 Sep 1912 in Farm, of TP, Cameron.Twp, Hall.Co.NE Note 5: Abt. 1868 Attended UIU at Fayette. Note 6: Bet. 1868 - 1875 Farm work & taught school. Note 7: Bet. 1875 - 1877 U. of Iowa Law School, Iowa City. Note 8: Bet. 1877 - 1879 Law Office, Brush Cr, with brother Wm. H. Note 9: 1873 Uncle Alex Thompson & bro/law Lemuel Wood had moved to Hall.Co.NE. Note 12: 1879 Moved, Grand Island, Hall.Co.NE, opened law office. Note 14: 1881 Brother Wm. H. joined from Brush Cr. Note 15: Bet. 1881 - 1892 Law partnership with brother Wm. H. Note 16: Bet. 1881 - 1886 Law, plus insurance & real estate. Note 17: 1891 Appointed District Judge from Grand Island. Note 18: Returned to Law Practice; managed extensive property interests. Note 22: Involved with Populist Party. Note 24: Lawyer of outstanding ability (Thompson Genealogy). ... +PRYSE, Elizabeth A. V. b: Abt. 1855 in Wales? d: 08 Dec 1888 in Grand Island area, Neb. m: 24 Oct 1880 in Iowa City, IA Father: David R. PRYSE Mother: Elizabeth UNKNOWN Note 3: Called Lizzie. 3 THOMPSON, Anna Grayce b: 30 Jun 1883 in Grand Island area, Buffalo Co, Neb d: 09 Mar 1952 Note 3: Name, Grace Anna. 3  THOMPSON, Elizabeth Katherine b: 30 Jun 1883 in Grand Island area, Buffalo Co, Neb d: 1962 Note 3: Name Katherine Eliza. .... +CARR, Howard b: 1883 d: 1958 Note 3: Given name, Harlow? 3 THOMPSON, John Pryse b: 07 Sep 1885 in Grand Island area, Buffalo Co, Neb d: 1956 Note 3: Abt. 1905 Attending Ag School, U. of Neb. at Lincoln. Note 4: Farmer/rancher. ... +JONES, Sarah A. d: 08 Jul 1908 m: 25 Jul 1900 Note 3: No children. 2 THOMPSON, William Henry b: 14 Dec 1853 in Perryville, Perry.Twp, Carroll.Co.OH d: 06 Jun 1937 in Grand Island, Hall.Co.NE Note 6: Bet. 1872 - 1874 Attended UIU at Fayette. Note 7: U. of Iowa Law School, Iowa City. Note 8: Bet. 1877 - 1881 Attorney at Brush Creek Fayette Co, IA. Note 9: Abt. 1881 Moved Grand Island, Hall.Co.NE, law partnership with brother John R. Note 13: Bet. 1919 - 1937 Involved in commission that erected Neb. Capitol. Note 14: Bet. 1924 - 1931 Neb Supreme Court Justice. Note 15: Bet. 1933 - 1934 Appointed, U.S. Senator from Nebraska Note 22: Info/text in notes section/report view. ... +HUTCHISON, Minnetta Nettie Inez b: 08 Oct 1860 in Belleville, Wayne.Co, SE Miich d: 02 Jul 1944 in Grand Island, Hall.Co.NE Burial: Grand Island Cem, NB. m: 07 Sep 1879 in West Union, Fayette Co, IA Father: John Hamilton Hutchinson HUTCHISON Mother: Martha Minetta LICKISS Note 3: 1879 Married at parents home in West Union. Note 4: 1879 Fayette Co, IA, deputy recorder. 3 THOMPSON, Edith Lyle b: 23 Aug 1880 in Brush Creek (Arlington), Fayette Co, IA d: 31 Aug 1904 in Grand Island, Hall.Co.NE Burial: Grand Island Cem, NB; parents plot. Note 2: 1904 Living in Cedar Rapids, IA. Note 3: Died, parents home, was preganant or possibly in childbirth. Note 4: 1904 Went to visit paretns at time of death. .... +PORTER, Wallace E. b: 1880 d: in Kansas City, MO Burial: Shrinner's Cem, KC? m: 08 May 1901 in Grand Island, NB Father: E. J. PORTER Mother: Unknown SEARS Note 3: English. Note 5: 1904 Traveling salesman, McClusky Reg. Co, later sales manager. Note 6: In Mason City at time of wife's death. 3 THOMPSON, Martha b: 1884 in Grand Island, Hall.Co.NE d: 1884 in Grand Island, Hall.Co.NE Note 4: Called Mattie. 3 THOMPSON, Grover b: 03 May 1886 in Grand Island, Hall.Co.NE d: 1970 in Casper area, WY Note 4: 1907 Moved western NB. Settled on Sidney Divide, P.O. Leafdale. Note 5: Federal appraisor, Home Owner's Loan Corp, ten years, in Casper WY. Note 6: 1913 Purchased 160a ranch near Glendo, WY. Note 8: 1950 Glendo ranch, grown to 4000a. Note 9: Would inherit grandfather Eli's farm. 3 THOMPSON, Lloyd Garrison b: 25 Apr 1889 in Grand Island, Hall.Co.NE Note 5: Info from Hist.Hall.Co.Neb in notes section. Note 6: Practice law with father in Grand Island, Neb. Note 14: 1954 Resided, suburb, Miami, FL, real estate, investments. 2 THOMPSON, Ellen Priscilla b: 1856 in Perryville, Perry.Twp, Carroll.Co.OH d: 31 Oct 1884 in Grand Island, Neb Note 3: Called Ella. Note 4: Married by Rev. Bailey. ... +SCOTT, Henry m: 01 Mar 1881 in West Union, Fayette Co, IA Note 3: 1881 Residing Fairbank area, Fayette Co, IA, at time of marriage. Note 4: Remarried after death of Ella. 3  SCOTT, Wilfred Dwight b: 19 Dec 1881 in West Union area, Union.Twp, Fay.Co.IA d: 1960 Note 3: Married first cousin. Note 4: Construction & electical work. Note 5: 1925 Living, Waterloo, IA. Note 7: 1954 Living 922 Bodwitch Ave, Aurora, ILL.
.... + WOOD, Zella Minerva b: 15 Jan 1881 in Brush Creek (Arlington), Fayette Co, IA. m: Jun 1912 in Sargent, Custer Co, Neb. Father: Lemuel L. WOOD Mother: Minerva Alma THOMPSON Note 1: Name? Zella? Note 2: Married first cousin. Note 3: 1910 At home; teaching school, Sargent, NB. Note 5: 1925 Living, Waterloo, IA. 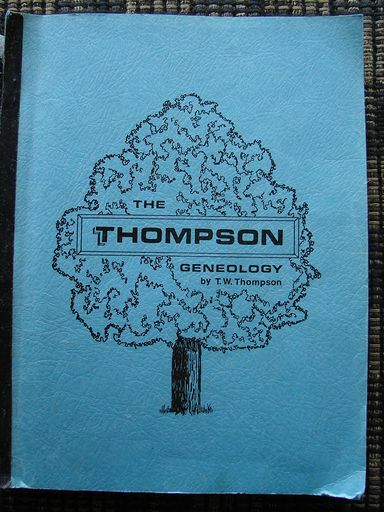 2 THOMPSON, Martha E. b: 1858 in Perryville, Perry.Twp, Carroll.Co.OH d: 1889 in Redlands, CA, from TB. Note 3: Called Mattie Note 5: Married by Rev J.H. Barnes of Fayette. 3 GREGORY, Bertha M. b: 1881 in Brush Cree (Arlington), Fayette Co, Iowa Note 3: May have married Wilfred Dwight Scott? Note 5: 1954 Living, Stubenville, OH. 2 THOMPSON, Katherine L. J. b: 04 Jun 1859 in Perryville, Perry.Twp, Carroll.Co.OH d: 26 Jun 1876 in Brush Creek (Arlington), Fayette Co, IA Burial: Brush Creek (Arlington, Groat) Cem, Sec 32, Fairfield.Twp, Fay.Co.IA Note 2: Unmarried Note 3: Age 17y22d. 2 THOMPSON, Isaac Ross b: 17 Mar 1866 in Brush Creek (Arlington), Fayette Co, IA d: Aug 1943 in Des.Moines, Polk.Co.IA Note 4: 1889 Census; Eli56 blacksmith, Eliza55, Priscilla20 teaching, Ross13, Brush.Creek, Fay.Co.IA. Note 5: Early Brush Creek harness/trotter breeder/racer with Joe Glime. Note 6: Continued to breed/race trotter/harness horses at Des.Moines. Note 7: Possibly? attended law school at IA.City or Des.Moines, bz/2012. Note 12: Jan 1897 First paper listing in Des.Moines, bz/2012. Note 15: 1900 Census; IsaacR34 lawyer, Emma35, neice Jennie Bunge1875Aug, 22ndSt, Des.Moines.IA Note 16: Would become prominent in real estate, law, politics, civic activities, trotter breeding. Note 17: 1905 Census; I.Ross & Emma, 2301Carpenter.Ave, Des.Moines.IA. Note 18: 1910 Census; I.Ross43, Emma45, speculator, contractor, builder, Des.Moines.IA. Note 19: May 1913 Des.Moines paper; Ross, lawyer, auto accident, arrested intoxication. Note 20: 1920 Census; I.Ross54, Emma54, house contractor, Carpenter.Ave, Des.Moines.IA. Note 22: 1925 Census; Ross59, Emma59, Ward2, Des.Moine, Polk.Co.IA. Note 24: 1930 Census; I.Ross64, Emma64, real estate sales, Des.Moines.IA. Around Main St, Arlington, Iowa, during the 105th Thompson Reunion, Aug 9, 2009. Small file size pics with an early digital camera around Arlington. Arlington, Iowa, newpaper article, 49th Thompson Family Reunion. First cousins, 1940 Thompson Reunion, Arlington, Iowa, City Park. Minutes of the 1933 Thompson Reunion at Allen's Wildwood Spring (Brush Creek Canyon), 3mi N of Arlington, Fayette Co, Iowa. Son of Samuel 1 Andrew and Martha Jane Sherman Thompson. Move with brother Samuel 2, from Fayette Co, Iowa, to farm just east of Harper, KS, in the early 1880's.